Scientists taking a hard look at America's climate future foresee long-lasting droughts later in this century unlike any in the last thousand years. The primary blame belongs to global warming from human activities, according to a study released today in the new open-access journal Science Advances. Climate forecasts for the whole globe are well established. The scientific community accepts that when you consider the planet as a single pixel, adding carbon dioxide to the atmosphere inevitably makes the world hotter. However, climate forecasts for smaller regions of the world-- like individual continents-- are more of a cutting-edge exercise. Models differ and uncertainties are important. But in this new study a team of three climate scientists—Benjamin Cook (NASA), Toby Ault (Lamont-Doherty Earth Observatory) and Jason Smerdon (Cornell)—made regional forecasts that project intense drying in two large parts of the U.S.: the Central Plains and the Southwest. Cook's team started by taking a group of 17 leading computer climate models and running simulations of the climate from 1931 through 2099 that include rising average temperatures. They generated two alternative futures: 1) a "business-as-usual" simulation in which nothing much changes in our global greenhouse gas emissions; and 2) a more moderate scenario in which we make some progress in shrinking emissions. Cook's team ran the models a thousand times and determined the statistically best results, the so-called Monte Carlo technique. The results are consistent: more heat and greater evaporation mean less water in the soil. For the second half of this century, the results point to a state of unrelenting severe drought. 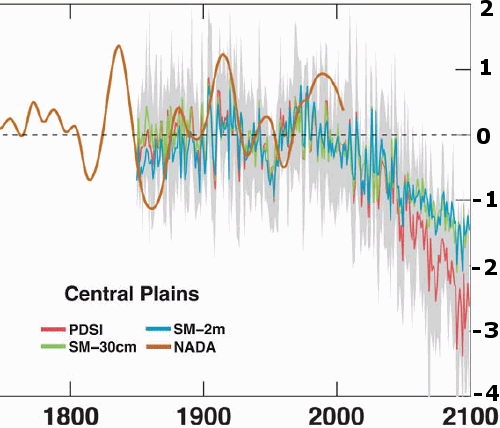 PDSI levels for the whole period 2050 to 2099 under the business-as-usual scenario. Dashed lines outline the Central Plains and Southwest regions that were modeled for the Science Advances study. Note that the Southwest region includes California. 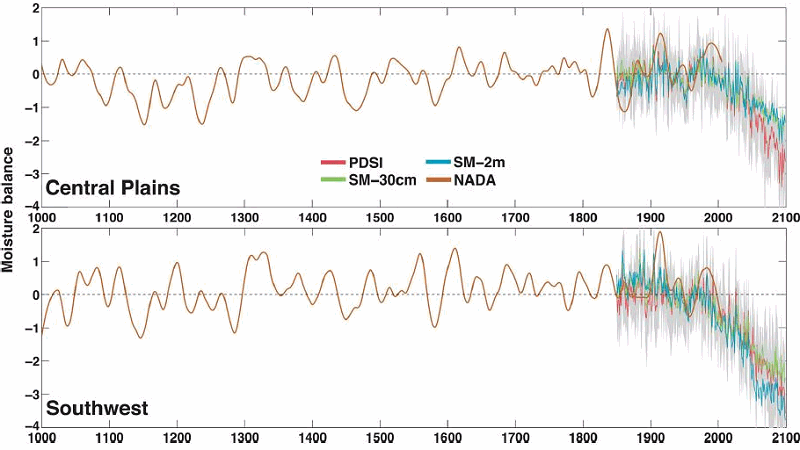 Their next step was to compare their 21st-century forecasts to the climate record of the past. 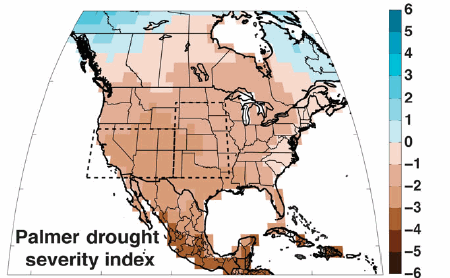 For that they took the North American Drought Atlas (NADA), a well-regarded record of summer droughts based on tree rings that goes back 2000 years and translates directly to PDSI numbers. Here are the results for the Southwest region since about 1750—approximately the historical record. The tree-ring record shows that the upcoming droughts would greatly exceed anything in the historical record. Note that California is part of this region. 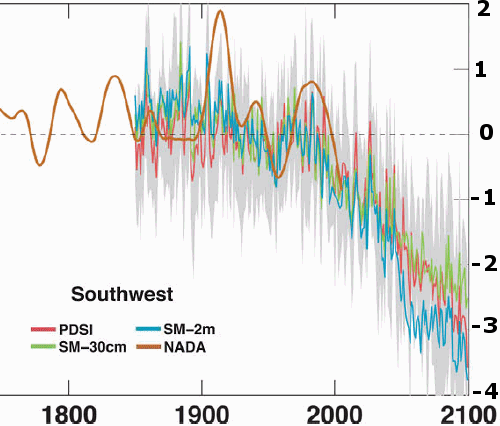 Forecasted drought in the Southwest in terms of PDSI (red) and two other measures of soil moisture (blue and green), compared with the NADA tree-ring record (brown) since 1750. The gray zone is the range of the 17 different climate models used. The comparison for the Central Plains region is similar. Here it's interesting to note that in the mid-1800s, just before settlement began, this part of the West was known as the "Great American Desert." The study's projections show the area is likely to return to that state and then get worse. Forecasted drought in the Central Plains region compared with the tree-ring record. Cook's team looked farther back in time, and compared their 21st-century forecasts against the last thousand years of the tree-ring drought record. That record is our best gauge of natural variation, how much the climate swings back and forth on its own. The graph, at the top of this post, shows a future state of persistent drought exceeding everything in the last millennium. Severe "megadroughts" have happened in the past that lasted 10 years or longer. The authors fix the odds of one at about 12% during historical time. For the second half of this century, though, they put the chances of a megadrought at 80% or greater. "Our results," they conclude, "point to a markedly drier future that falls far outside the contemporary experience of natural and human systems in Western North America." Because we already pump more water out of the ground than the rains put back, the outlook is grim under business as usual and "nearly identical," they say, under the more moderate scenario. It doesn't take much thought to realize the changes that may be in store for the residents and ecosystems of these areas. Look for this paper, which is publicly readable, to be discussed wherever climate change is debated. The beauty of open-access science like this is that it helps keep arguments focused and gives everyone the chance to consult the evidence for themselves.